A bright future beckons for a musical inspired by the work of George Orwell. Beyond Wigan Pier successfully premiered at The Edge performance venue in April. The musical is the brainchild of musician and composer Alan Gregory. Following a rapturous reaction and rave reviews of the concert version of The Musical, it is exciting now that there will be a full version of the show put on in 2020. ” It was an absolutely spectacular event” comments Alan Gregory. Scott is truly honoured to be cast as George Orwell in the production. “I totally enjoyed performing alongside the amazing Olivia Garcia X factor star and all other cast members. It’s like being part of one big happy family. What an amazing feeling when the whole of the 1000 seat venue gave us all a standing ovation at the end of the concert. The duet single performed by myself and Olivia from the show, known as ‘You Look At Me ‘ is available to download from iTunes and all digital stores. 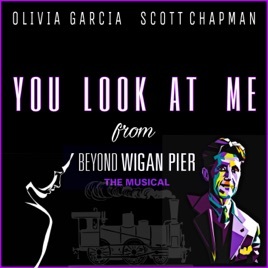 The ‘Beyond Wigan Pier The Musical Act 1 Concert Debut’ album is also available to download from all digital stores and the CD version is available from Amazon.com too. Roll on 2020!